This is the temple of the monastery called Hondo. The sitting (zazen) is done there as well as the Buddhist rituals such as Monk promotion. In those rituals the main entrance is used, otherwise the side door. Start to prepare for the trip well in advance: don’t change your shirt, socks or underpants at least for one week. Eat pea soup before the trip so in the train you will be able to entertain other passengers by farting “International”. Use a lot of deodorant (spray, not roll-on) and other perfumes, or hang a wunderbaum to your neck. Hairy dices in the same rope make an unforgettable impression. Order a self cost paperback | Download free PDF | En Español | SuomeksiThis is a stripped html version of the book and it does not contain layout or photos. All the nomadic and travel books by Päivi and Santeri Kannisto. 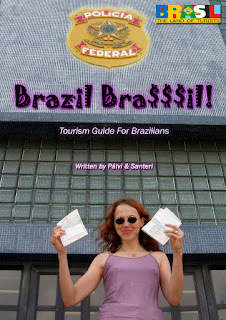 Brazil Bra$$$il!Tourism Guide For Brazilians1st edition.The original Finnish edition was published electronically on 14.2.2005 by Päivi & Santeri.This English translation was published electronically on 26.6.2006.